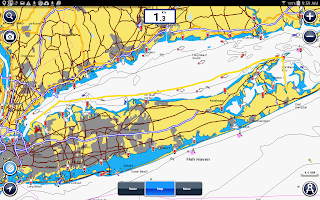 I did another 24 hour sail this time to Port Washington in Manhasset Bay on the outskirts of NYC. My track is the yellow line. I wanted a place to provision and stage my next hop to the Statue of Liberty through Hell's Gate on the East River where the tidal current is very strong. I had a wonderful sail down Long Island Sound where I was able to goose wing the sails for quite some time. Sunrise on the sound was surreal knowing that a huge city lay just around the corner. And finally Execution Rock Lighthouse was the scene of many tragedies before it was built in 1850.